The Birmingham Jewellery Quarter is Birmingham’s Historic and Vibrant Gem. With a prestigious background & 100’s of jewellery retailers and designers, it is the UK’s top centre for jewellery. It’s a place not only to buy jewellery but to visit the best art galleries, museums, restaurants and bars. This area with a rich history spanning over 250 years has long been home to some of the most highly-skilled jewellery makers and goldsmiths. It started by small tradesmen that led to the expansion of the area with new streets, elegant properties and fantastic profits. This place is responsible for around 40% of the UK’s jewellery production, with some of the biggest names in the jewellery trade continuing to operate from this impressive area. The Jewellery Quarter is famous for its Birmingham Jewellery Shops, having been a Mecca of jewellery production since the 1800s. It rapidly expanded during the19th century and being a designated conservation area with over 200 listed buildings & 30 restaurants, bars and cafes. All of which give the jewellery quarter a fascinating look and make it a vibrant place to work, live and play. It is an interesting place that attracts jewellery lovers as you can get everything from diamonds to wedding rings being readily available. There’s something for everyone, a must visit for anyone that wants to see the top UK jewellers in all their glory. All the stunning jewellery present here is of such high quality that you can’t fail to fall in love with each piece offered to you. The Jewellery Quarter has a lot more for you to explore, on the top of the list is ‘The Museum of the Jewellery Quarter’ housed in an old jewellery factory, The Pen Room Museum is also worth a visit. Make sure to spend your quality time with the jewellers in Birmingham. You can try out the art and building trails to get a real feel for the area, seek the historic cemeteries with their intriguing catacombs or simply relax around Birmingham’s last remaining Georgian Square with its galleries, restaurants and bars. All in all a trip to the Quarter is knowledgeable and enjoyable family day out. 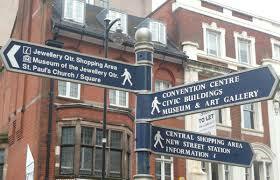 To rejuvenate yourself, do plan a visit to the heart of Birmingham, ‘TheJewellery Quarter’.